Every student at our college is required to take at least one course in Religion. One of those courses is Introduction to the New Testament, which I teach every semester. As you can imagine, not everyone is excited about the subject matter and many are convinced that the class will be otherwise useless. I begin the semester with a refrain that promises, “The NT and its subject matter are all around you. You only need to pay attention.” Throughout the semester I seek for opportunities to show the relevance of the course to discussions that are continually going on in the public sphere (including politics, sports, social commentary, etc.). To that end, I open class every Friday with a video of some kind in which Jesus or some element of the NT figures prominently. 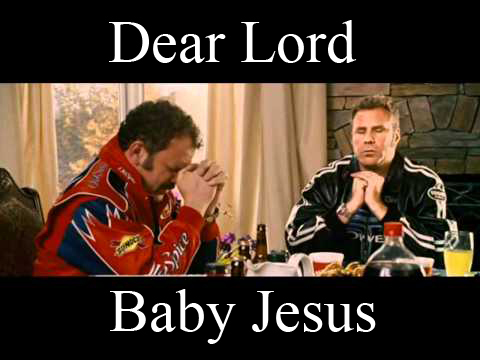 Today I began with Will Ferrell’s well-known prayer as “Ricky Bobby” In Talladega Nights (see below). For many this scene is simply humorous, but I pointed out that it can be viewed as a fairly profound theological statement. One of the more common tendencies throughout the history of Christianity has been to craft Jesus into a specific image according to a set of lenses. Matthew, Mark, Luke, and John did it. So did the church fathers steeped in Greek philosophy, as did the Reformers, as we do today, and on and on. I found that this opens up some interesting discussion and sets the table for the lecture (which today was on the Gospel of Luke). Take a moment to watch this scene again (or for the first time) and witness for yourself the various images of Jesus that can be present at one dinner table.